Not to be confused with Flame Flyer or Flame Rider. The Flame Runner (known as the Bowser Bike in Europe and Oceania) is a large-sized bike which appears in the game Mario Kart Wii. As the PAL region name suggests, the bike resembles Bowser; the coloring of the bike even mirrors Bowser himself. No other vehicles in Mario Kart Wii bear physical resemblances to its playable characters. The kart counterpart for this bike is the Flame Flyer. Bowser's Flame Runner makes a cameo appearance as a trophy in Super Smash Bros. for Wii U. The Flame Runner has great speed with good weight, drifting and mini-turbo: it is the third fastest bike in the game, behind the Sneakster and the Spear respectively. Its speed is tied with the Blue Falcon. However, the bike suffers from the worst acceleration among all bikes in the game, and its handling and off-road (tied with the Sprinter) are also rather low. On the Flame Runner, the color changes on the front wheel well and back wheel, the bike's body, and the exhaust pipe. Wii Mario Kart Wii (04/2008) Now THIS is a monster of a bike! It was obviously designed with Bowser in mind, since they both weigh a ton and both have trouble accelerating. Once you get up to top speed, though, these two really come into their own! Incidentally, Bowser is known as Koopa in Japan, but the Japanese name for this bike is Super Bowser. How rare. Now THIS is a monster of a bike! It was clearly designed with Bowser in mind, but since they both weigh a ton, they might have trouble accelerating. Once they get to top speed, though, they're a practically unstoppable team! Incidentally, although Bowser is known as Koopa in Japan, this bike still uses his English name there. The Flame Runner is one of six vehicles in Mario Kart Wii to go through a design change other than a palette-swap; the others being the Bit Bike, Wario Bike, Shooting Star, Spear, and Phantom. In this case, Bowser's and Dry Bowser's Flame Runner have their exhaust pipes positioned lower than the other bikes. Also, Rosalina's Flame Runner feature shorter handles than the other Flame Runners. 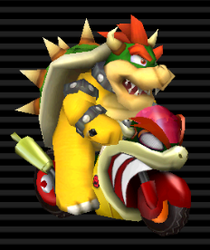 The Japanese name of the bike, Super Bowser, uses Bowser's English name instead of using his Japanese name of Koopa. This was later used with the DLC Bone Rattler from Mario Kart 8. If used with Funky Kong, its speed will tie with the Sprinter's default speed. This page was last edited on September 15, 2018, at 12:27.